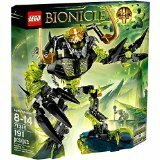 Are you on the hunt for a LEGO Bionicle toy set for your child? If so, you’ve come to the right place. 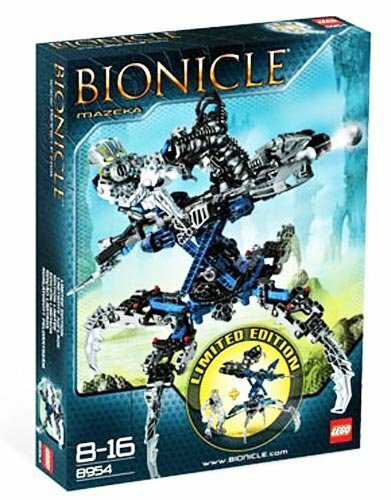 We’ve extensively researched and reviewed what some of the best Bionicle toys have to offer. Through our research, we discovered there were so many different options available – it’s no surprise that many parents feel so confused on which set to choose! Well, we’ve simplified the process for you. 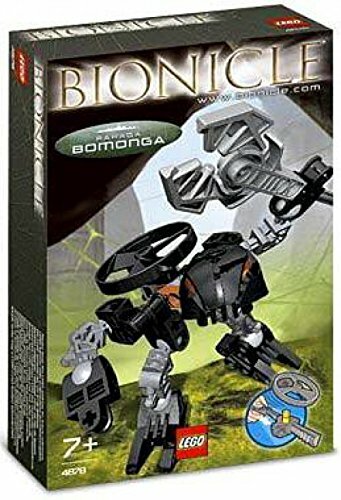 the 34 top Bionicle toy sets are detailed below. You can find all the main features, pros, cons, age recommendations, and what makes each toy stand out. There’s also a buyer guide section at the end to give you a little more clarity on the benefits of these toys and how to go about picking the best one for your child. 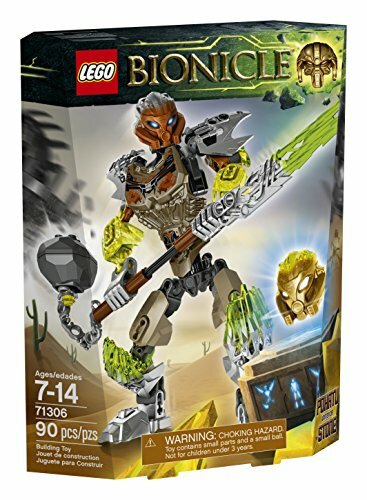 The Pohatu Uniter of stone LEGO Bionicle toy comes with a head that has the Unity Mask of Stone. There is also a trigger system which you can use that makes the mask pop off. This is incredibly fun for kids and adds another fun element. We also found this feature to be great for their motor skills while teaching them about cause and effect. The armor plate has been designed with a variety of colors and decorations. It’s more visually appealing and helps to spark your child’s imagination. There is a wheel attached to the toy which enables you to twist the torso for more playing options. This toy is also 8″ in height. Most kids find this to be a perfect size. The popping-off mask feature is super fun for kids. We liked how the wheel can be turned to swivel the torso of the toy for more playing options. Both features are great for motor skills. 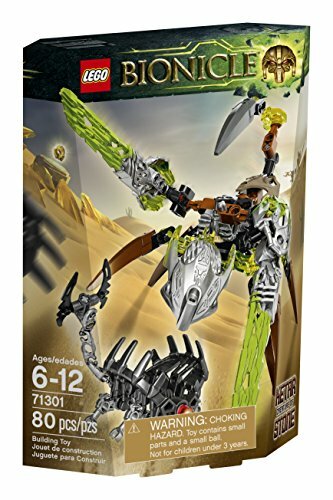 This LEGO Bionicle creatures Keta set comes with a fantastic blade design. It has been created to look like crystal claws. Kids have been loving this design feature and it encourages more creative play. We liked how you can change the position of the joints to make the figure stand in any pose you like. Furthermore, there’s a unity piece available, as well as a creature mask. Both of these pieces can be added or removed to provide your child with more customization over how they play. It’s around 3” in height, which makes it a smaller toy which may be better for younger kids. The blade design on this one stood out to us the most. The claw-style is a feature that kids love to use when making their Bionicle’s fight. It’s an awesome way to encourage imaginative play. Terak Creature of Eatch comes with an excellent claw design. You’re able to move the claws in a variety of positions which provides kids with more freedom when they play. The armor has been created with a crystal element which looks great. There’s also a mask and unity piece for kids to add or remove as they please. It measures in at 4” tall. Therefore, it’s a perfect size for most kids to handle comfortably. Parents have also been liking how the assembly is a small challenge but still easy enough for kids to do themselves. Users don’t have anything bad to say about this one! Kids like how they can move the claws in different positions. It gives them more control over how they play and promotes their imagination. 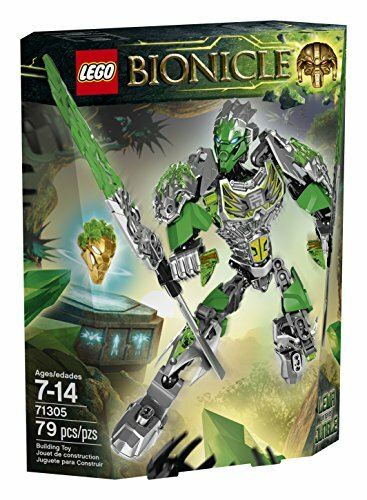 Lewa Uniter of Jungle is a LEGO Bionicle that comes with the head of the Unity Mask of Jungle. We liked how it has a trigger feature that makes the mask pop-off. It’s a ton of fun for kids to play with and helps to develop their motor skills. They’re also able to learn more about cause and effect too. A unity piece is included which can be attached or removed. Furthermore, all of the joints can be moved in a variety of directions. In addition to this, there’s a wheel which can be turned to make the torso move. This also enables kids to make the whirlwind blade spinner launch. We found this to be a lot of fun as it provides kids with plenty of freedom to play creatively. It stands in at 8” tall which is a perfect size for children’s hands. Kids are able to move the torso and limbs of this toy in any way they like. As a result, they’re given all the freedom they need to play with imagination. The pop-off mask and spin launching feature are also highly interactive. The LEGO Bionicle Skull Slicer Building Kit comes with a wheel which kids can use to operate the 4 arms. The 4-arm design makes this toy perfect for battle play and helps children to play with more creativity. Using the wheel to function the toy is also fantastic for developing their motor skills and hand-eye coordination. There are hook blades available which you can use to pull off the mask. This is a lot of fun and highly interactive. We liked how they’ve created this Bionicle toy to be durable. This is a big benefit considering that the 4-arm battle design will have it deep in action a lot of the time. It stands at a little over 7” tall which most kids find to be great for handling. The 4-arm battle design and wheel control features make this toy highly interactive. It also develops your child’s motor skills and coordination. The Onua Master of Eatch LEGO Bionicle Toy has a fantastic pop-off mask feature. It works by pressing a trigger button and seeing the mask come off. This is a very fun and interactive feature that helps kids develop their motor skills. It’s also effective at teaching them about cause and effect. There is a total of four Bionicle shells which are golden in color, as well as shovelers and various decorations for the chest piece. These all provide kids with more ways to play creatively. We liked how you can put this Bionicle toy into a variety of poses. Furthermore, this toy is very durable. Therefore, it can withstand the usual wear and tear that these toys undergo during playtime. It’s 7” tall which is a great size for most kids to handle. The pop-off mask feature is super fun and provides kids with a way to develop their motor skills. This toy is also very durable so that it can resist any damage from play fights with other figures. The Skull Scorpio LEGO Bionicle Building set measures in at a total of 4 x 10 x 7″ in size once it’s fully assembled. Kids find this to be a perfect size that allows them to play as creatively as they like. We were impressed with how it comes with a unique trigger feature. There’s a trigger button located on the tail which causes battle stinger to activate. This is a ton of fun and highly interactive. The mask also has a trigger feature which can be pressed to pop the mask of the character. It’s another interactive mode that develops your child’s motor skills. Parents have been liking how this toy is also incredibly durable. This makes it effective at withstanding any damage from play battles. The trigger tail and mask features are a ton of fun for kids to play with. It gives them more interactive features to incorporate into their pretend play, which also develops their motor skills. 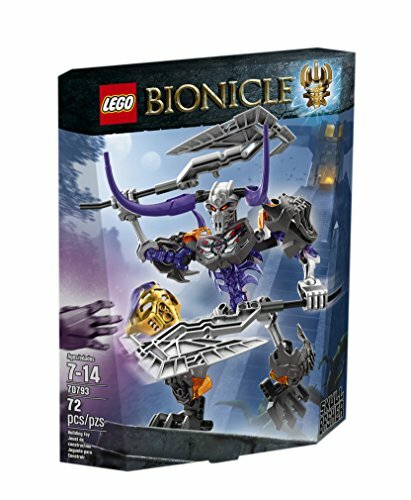 This Mask Maker vs. Skull Grinder LEGO Bionicle Building Kit comes with the Mask of Creation. Its battle arm feature can be easily activated for kids to play within pretend battles. There’s also a Hammer of Power rapid shooter feature which can fire out mini pieces. This is highly interactive and very stimulating for kids. We were impressed with how the toys in the set are built with durability. This makes them effective at withstanding the battles that your kids put them through. The Skull Grinder is 8” tall whereas the Mask Maker is 5” tall. We found these sizes to be perfect for kids to handle and play with comfortably. With two durable figures to play with, kids are able to put them straight into battle and have a blast right away. the Hammer of Power rapid shooter feature is visually stimulating and fun for kids too. 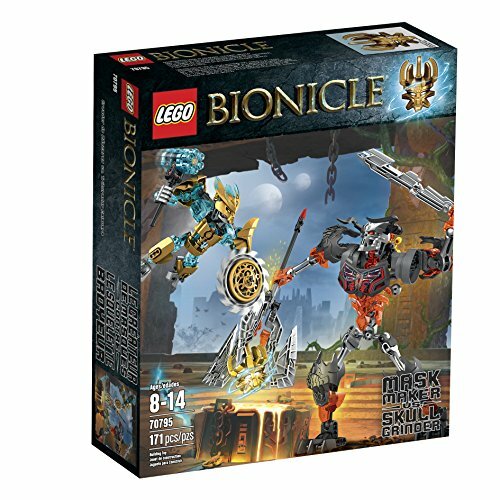 The Skull Basher LEGO Bionicle Building Kit comes with a unique bash mode. This feature can be activated by pressing the trigger and it provides kids with a unique and fun way to use the toy in pretend battles. We also found it to be effective in teaching children the concepts of cause and effect while also developing their motor skills. The hook axes provided enable you to pull off the hero’s mask which adds to the creative aspect. Not to mention, the mask on this figure has a pop-off feature which is very interactive. The toy has been designed to be remarkably durable in order to withstand intense play battles. It’s also 7” tall which kids find to be perfect for playing with. LEGO Bionicle’s Pohatu Master of Stone Toy has an awesome pop-off trigger mask feature. This allows kids to remove the mask of the figure in a fun way which also improves their motor skills. We were impressed with how this toy comes with two different weapon accessories. They have a convertible feature which means they can be used as either Stormerang or Jeterang weapons. This gives children more customizable options to play with more freedom and promote creative play. Due to how the limbs move, kids can create all kinds of poses for the figures. Not to mention, this toy is incredibly durable. Therefore, it can withstand rough play for years to come. It’s also 7″, which is an excellent size for kids to play comfortably. The convertible weapon accessory feature is fantastic as it gives children more options to play with and be as creative as possible. The LEGO Bionicle Gali Master of Water toy has an awesome feature where the mask pops off as a result of pressing a trigger. This is a lot of fun and helps kids to develop their motor skills. We liked how this toy included two shark fins, as well as an accessory that can be used as either a trident or harpoon. It provides children with plenty of options to play with and encourage their creative side to run wild. They can also adjust the limbs in a variety of positions to make up different poses for the toy. The figure is also remarkably durable. Therefore, it can withstand hours of pretend-play with no issues. It’s 8” in height which kids find to be a great size. They find the toy easy to handle and play with. With the convertible weapon feature, kids are able to play with this toy in a variety of ways to help them be more creative. 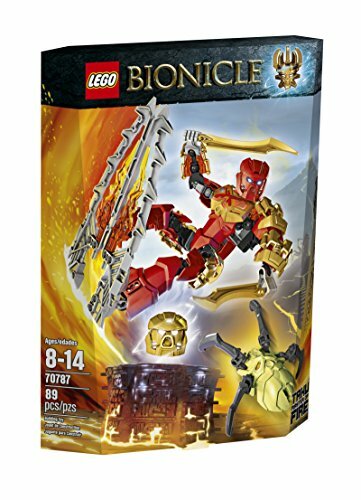 The LEGO Bionicle Tahu toy comes with an accessory sword weapon which kids love using while making it fight against other toys. It also has a shield and mask which adds a layer of armor to the figure. These features help kids to play more creatively and explore different playing options. This set features a total of 19 pieces. There are also instructions which your kids can easily follow to build the toy. This is awesome for their motor skills and coordination. Not to mention, it strengthens their reading ability too. Since this toy comes with accessory swords, shields, and masks, kids can’t help but create different kinds of battles and scenarios for more imaginative play. Building the toy also develops their coordination and motor skills. The LEGO Bionicle Protector of Water Building Kit has an awesome rapid shooter design. This enables kids to shoot out little pieces to play with a ton of creativity. The mark has a pop-off function which is a lot of fun and teaches them about cause and effect. We liked how the legs and arms can be adjusted in length. 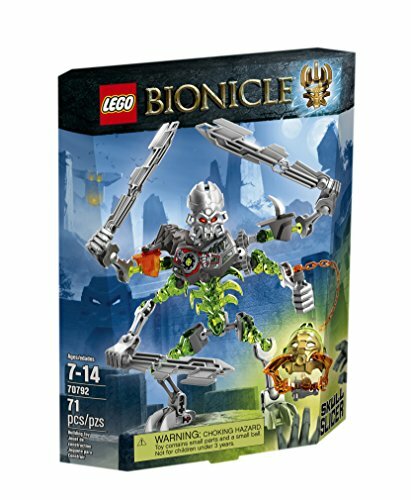 This allows children to alter how their Bionicle toy looks with complete precision. It can lead to some awesome poses too. The toy is a little over 5” in height, which is a perfect size for kids. It’s easy enough for them to handle and play with. We liked how the arms and legs on this toy can be adjusted. It allows kids to create unique and fun poses. Not to mention, the rapid short feature is incredibly entertaining and encourages creative play. The Skull Warrior LEGO Bionicle Building Kit has a fantastic turning wheel feature. This is what kids can use to move the battle arms while playing. This is very interactive and effective at helping to develop your child’s motor skills and coordination. There is a hook blade featured which enables you to pull off the hero mask. It’s another interactive and entertaining feature which kids love to play with. A rapid shooter feature is available too, which encourages kids to play with complete creativity. We were also impressed with how durable this figure is. As a result, it can withstand any damage from rough play. It’s 7” tall, which many kids have found to be a comfortable size to handle. The wheel feature is what kids use to control the battle arms. It’s super interactive and ensures your child is able to develop their motor skills and coordination. 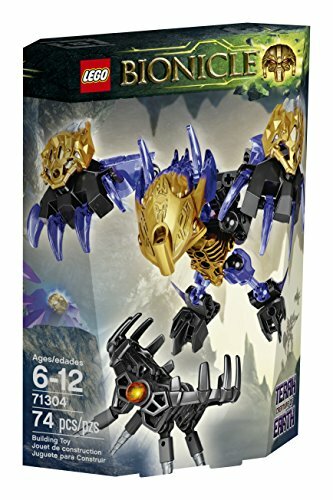 The Rahaga Mini LEGO Bionicle Figure Set comes with a total of 28 pieces. There are also instructions included which kids can use to build the toy. This is fantastic for their reading skills and ability to follow instructions. While building the toy, they’re also able to improve upon their motor skills and coordination abilities. Children also feel a great sense of accomplishment once they’ve assembled the toy. Once it’s ready to go, your child will be able to play with it for hours on end. We couldn’t find any downsides! With 28 pieces available for your child to put together, you can be sure that their motor skills are given the chance to develop. The Tahu Uniter of Fire LEGO Bionicle toy comes with a mask that has the pop-off feature. You can activate this function by pressing a trigger. This adds another element to play that kids have been finding entertaining. It’s also great for helping to develop their motor skills. The armored chest plate has been designed with various decorations to make the toy look more visually appealing. We also liked how the joints can be moved in a wide range of directions. This enables kids to create all kinds of poses and play creatively. At 9” in height, many kids are liking how it’s slightly larger in size. It encourages them to play with more imagination. With a mask pop-off feature, kids are able to press the trigger and develop their motor skills while gaining deeper understandings of cause and effect. 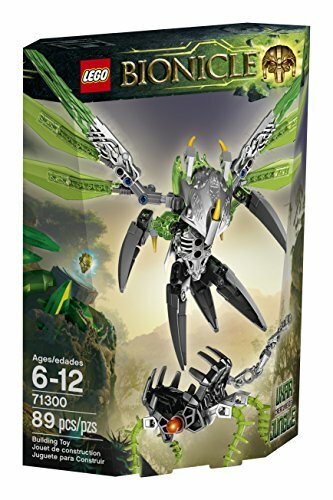 This Uxar LEGO Bionicle Create of Jungle comes with a unique wing design feature. We were impressed with how you can change the position of the wings into a pose that you like the best. Furthermore, all the joints of the toy can be moved into posing positions too. It’s a great way to provide kids with more freedom and creative control over how they play with their toys. At 3” in height, it’s one of the smaller Bionicle toys in our review. Therefore, it may be best suited for younger children’s smaller hands. We liked how they’ve incorporated a wing design that can be moved into different posing positions. It enables kids to play with more imagination. LEGO Bionicle’s Akida Creature of Water has a fantastic shooting function that fires out mini torpedoes. As you can imagine, this is a ton of fun for kids to play with and it inspires them to play with a lot of creativity. There’s also a fin feature which can be moved around. As a result, kids are given complete control over how they want the pose of the toy to look. They’ve included a small stand on which you can place the figure on too. It’s 8” tall, which many kids have been loving. The larger size gives them more to hold onto and play with. With a small stand included and the ability to alter the pose of the fins, children are given plenty to play around with and customize. Therefore, their imaginative side is sparked. 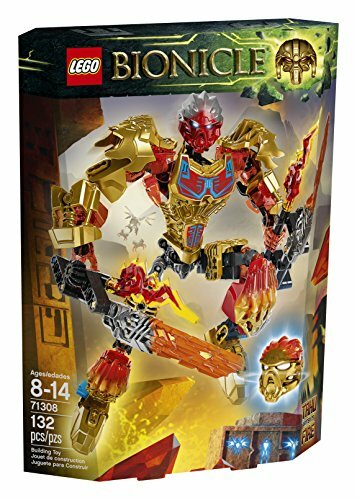 The Tahu LEGO Bionicle Master of Fire features a mask that can pop-off feature. This involves kids pressing the trigger and watching the mask come off the figure. This is highly interactive at develops their motor skills. We liked how it included elemental fire blades and a lava surfboard which can be converted into one or the other. It provides kids with more playing options to be as creative as they like. Not to mention, there are two golden sword accessories included too. It’s an extremely durable toy. Therefore, you can expect it to last your child for years of play. Kids have been liking how the 8” tall design gives them a lot to play with and handle. We liked how this toy comes with a variety of accessory weapons as it enables kids to add more into their pretend play scenarios. As a result, their imaginative side is able to run wild. LEGO Bionicle’s Pahrak toy set comes with a total of 41 pieces. This is a lot of pieces which kids have an absolute blast putting together. They provide you with clear instructions which many parents have left their kids to do on their own. This is fantastic for their independence. It also helps them to develop their problem-solving, coordination, and motor skills. Once it is put together, kids feel a great sense of accomplishment. They’re then able to have a ton of fun creating different scenarios and playing creatively with their figure. Parents also like how a storage container is included as it can be reused. With 41 pieces to put together, your child will be engrossed in putting the toy together. It’s a fantastic exercise for their independence and problem-solving skills. Once it’s all assembled, the toy also encourages them to play creatively. The Onua Uniter of Earth LEGO Bionicle toy has a trigger feature which allows kids to make the mask pop off. This is a super fun feature that provides kids with more playing options. It’s also effective for developing their motor skills. We liked how they’ve created the armor chest plate with various decorations. This gives the toy more of a visual flair which stimulates your child’s senses. It also encourages them to play more creatively. Furthermore, they’ve included a unity piece which can connect to the joint of the toy. These joints can be moved in all directs which gives children more freedom while playing. At 8” tall, many kids find this size to be perfect. It’s easy to handle and make the toy do different moves during play battles. The decorated chest piece, moveable joints, and pop-off mask feature are all awesome features that encourage kids to play with more imagination. 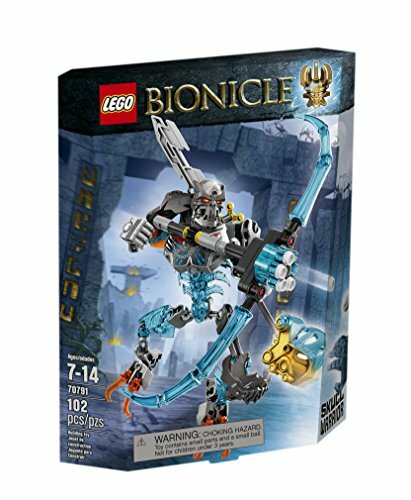 This Kopaka Master of Ice LEGO Bionicle Toy has a fantastic trigger feature which enables kids to make the mask pop off. This is very entertaining and also helps kids to develop their motor skills. We liked how it comes with various decorations for the leg and chest pieces. It provides children with more to look at and be inspired to play creatively. There’s a convertible accessory piece which can be used as either avalanche skis or a shield. 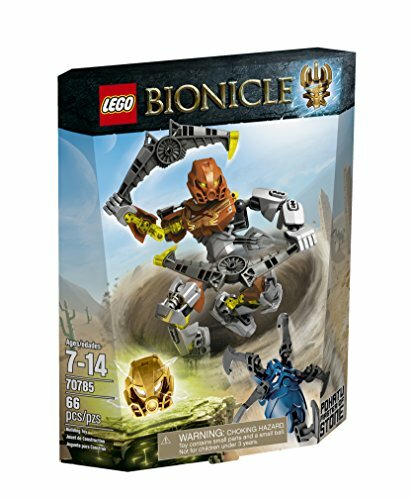 This gives kids more options to play with the Bionicle toy in a variety of ways. All the joints can be moved in various directions which makes play battles a lot of fun. It also means kids can create whatever poses they like for the toy. It’s incredibly durable and able to withstand rough play too. Kids also like how it’s 7” in height as it feels easy to handle and play with. With a convertible accessory piece, pop-off mask feature, and decorations on the chest and legs, kids can’t help but feel inspired to play with more imagination. 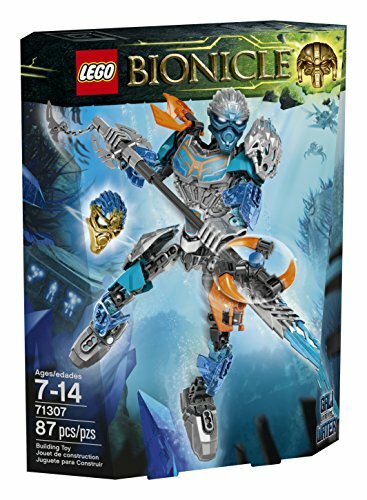 The LEGO Bionicle Legends Kiina toy stands at 7” in height. We found this to be a perfect size for most kids. It allows them to hold onto the toy comfortably and be able to make it do a variety of moves while play fighting. This toy comes with a vapor trident that has a dual-head design. It provides kids with more to play with and boosts their creative play abilities. Furthermore, children have been loving how they’ve equipped the toy with a Thornax launcher. This shoots out small pieces which are extremely entertaining. It also stimulates your kid’s visual senses and helps them to develop better. The launcher and accessory weapons included are fantastic at encouraging children to create different scenarios and play with a lot of creativity. 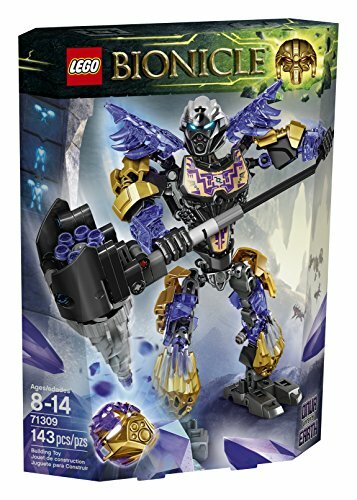 This Protector of Stone LEGO Bionicle toy comes with adjustable legs and arms. Kids have been loving this feature as it provides them with complete control over how they play with the toy. As a result, they can play with as much imagination as they like. Adjusting these parts is also a good exercise for their coordination and motor skills. A rapid shooter is equipped with this toy which is a lot of fun. It adds a new element of play which also stimulates your child’s visual senses. In addition to this, the mask has a trigger activated mask pop-off feature. Kids can easily make the mask pop off at any time while playing. We were impressed with how durable this toy is too. You can be sure that it will withstand years of rough play. The combination of the mask pop-off and rapid shooter features, kids are able to play with a lot of creativity. Their motor skills and coordination are also able to develop as a result of using the adjustable leg and arms feature. 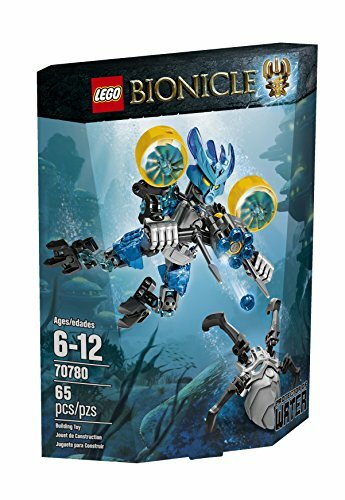 This Gali Uniter of Water Bionicle toy is equipped with an armor chest plate that has been designed with decorations. This makes it look more visually appealing and fun for kids to play with. They’ve also included a pop-off mask feature which kids can activate by pressing a trigger. It’s a lot of fun and adds a fresh element to their play battles. We also found it to be effective at strengthening your child’s motor skills too. At 8” in height, many kids love the scale of this toy. They find it easy to hold onto and move the various parts in their pretend battles. The size of this toy and the pop-off mask feature enables kids to play with a lot of imagination. At the same time, their motor skills are also given the chance to develop too. The Kohrak LEGO Bionicle toy comes with shields that kids love using in their pretend play scenarios. It’s a great additional item that encourages more creativity. We also liked how they included a lever system at the back of the toy’s head. This makes the figure’s head move forward quickly. It’s a fun effect that can add a new element to the way kids play with it. With a total of 40 pieces available, you can be sure that your child can develop their coordination and motor skills while building their toy. There are instructions that come with illustrations to make the assembly process a little easier for kids. As a result, their reading skills and ability to follow instructions are improved. They’ll also feel a sense of accomplishment once they’ve completed building it. Customers haven’t got a complaint about this one! Kids are able to put their reading and motor skills to the test while building this 40-piece Bionicle toy. The lever function and shield accessory are great features for helping children to play with more imagination too. 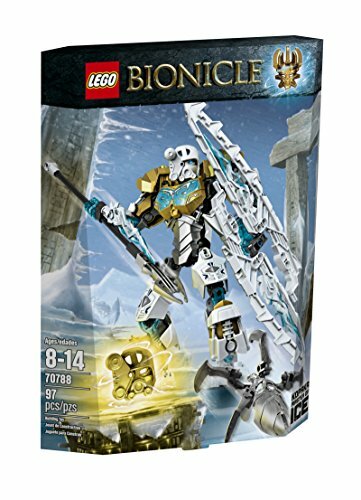 This Tao Nuju White Lego Bionicle comes with a total of 48 different pieces. There are instructions included which kids can follow. Therefore, this toy gives them the chance to develop their motor skills and coordination. Since their following the instructions, their reading and language skills are also able to improve too. This is a fantastic exercise that ensures kids feel accomplished once they’ve built their toy. It has two crystal spike accessories which children can use in pretend play to make the toy climb up structures. This is an excellent way to encourage your child to play more creatively. Since there are 48 pieces and instructions, kids are able to improve their motor skills and reading abilities. The accessory items are awesome for promoting more imaginative play as well. The Mazeka Limited Edition Vehicle Set has a fantastic 360-degree rotating turret feature. This is incredibly fun for kids to use and helps them to play with a lot of imagination. Moreover, they’ve included a total of 9 spears which can be used during pretend battles. We liked how the swamp strider included has adjustable legs. It provides kids with more customizable options while playing. With an incredible 301 pieces, your child will be occupied for a while putting this one together. There are instructions included which show you how to assemble the vehicle step-by-step. It gives kids a chance to develop their reading skills. The assembly part is awesome for their motor skills and coordination. Kids are loving this set! This is an extensive Bionicle playset that has 301 pieces, meaning kids are able to put their problem-solving and motor skills to the test. Once it’s all assembled, the toy’s 360-degree swiveling turret will have them entertained for hours! 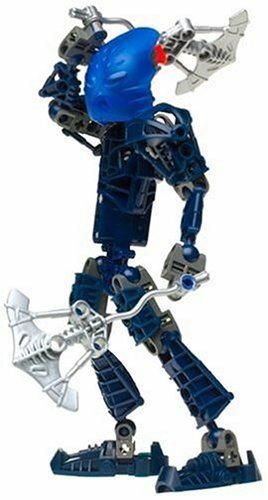 The Blue Toa Nokama LEGO Bionicle is equipped with two hydro blades. Kids have been loving this feature as it allows them to add new elements to their pretend battles. Therefore, it encourages them to play with more imagination. We liked how there are 46 different pieces which need to be assembled. It enables kids to develop their problem-solving and motor skills. The instructions included also help to improve their reading abilities. With the dual hydro blades, kids are able to play with more imagination and come up with inventive play fights. The building aspect is awesome for their problem-solving and motor skills too. LEGO Kopaka and Mulum Unity Set is a lot of fun for kids. The Kopaka figure has a pop-off mask feature which can be activated by pressing the trigger. This is entertaining and helps to develop your child’s motor skills. We liked the Kopaka toy has also been designed with decorations on its armored chest piece. This makes it stand out more and be visually appealing for kids. The joints can also be moved in all directions for more freedom while playing. The Melum figure has an armor piece which can be easily attached and removed. It provides kids with more options over how they play with their toys. Kids are given more freedom to play with these two toys as they like. Therefore, their imaginative play side is able to develop well. Not to mention, your child’s motor skills are able to improve as well. This Strakk LEGO toy has an awesome design that kids have been loving. 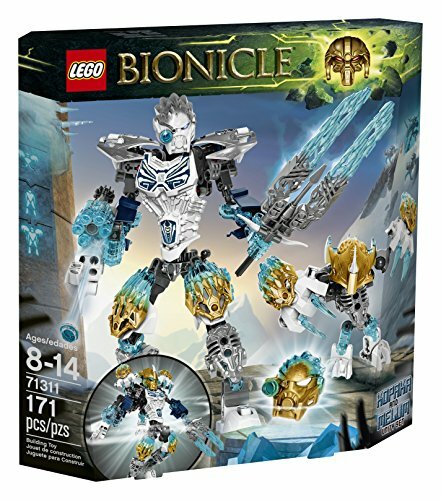 Its shoulders and have icicle spikes on them which add a fantastic visual aspect that we haven’t seen with any other Bionicle toy. They’ve also included an ax that is made to look like translucent ice. These design elements are awesome for encouraging kids to play with more creativity. We liked how tall the limbs can be moved in all directions too. This enables kids to have more control over exactly how they move their figures while in battle. With 46 pieces available to put together, your kids will also be able to develop their problem-solving and motor skills. Once it’s all assembled, the toy measures in at a little over 7” in height. Many kids find this to be a perfect size for their playing needs. The icy spikes on the mask and shoulders make this toy look fantastic. This design, coupled with the awesome accessory weapon and fully moveable limbs gives kids all they need to play with plenty of imagination. 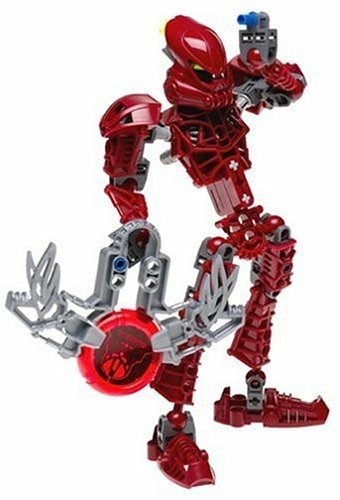 The Red Toak Vakama has an excellent disk launcher available. This is a highly interactive feature which kids have been finding to be a lot of fun. It gives them more to play with and be creative while creating their own play battles. There is a total of 48 LEGO pieces available. Therefore, kids are given plenty of parts to put together by following the instructions. It’s an awesome exercise for their motor skills that also develop their reading abilities too. Kids have been loving the disk launcher as it enables them to play with more creativity in their pretend battles. The instruction guide helps to develop their reading skills and building the toy is great for improving motor skills too. LEGO’s Umarak the Destroyer is equipped with a fun pop-off mas feature. This can be activated by pressing a trigger which is very interactive and fun for kids. It’s also a great exercise to improve their motor skills. There’s an armored chest piece that has been designed with various decorations. This makes the toy look more visually appealing and exciting for kids to play with. We liked how it comes with a turning wheel feature which kids use to control the torso. This is what helps them to play with more agility and speed. It’s also another great exercise for their motor skills, as well as their coordination abilities. The turning wheel function, pop-off mask feature, and chest piece design all come together to help kids play with plenty of imagination. It’s also a great option for helping your child improve their coordination and motor skills. 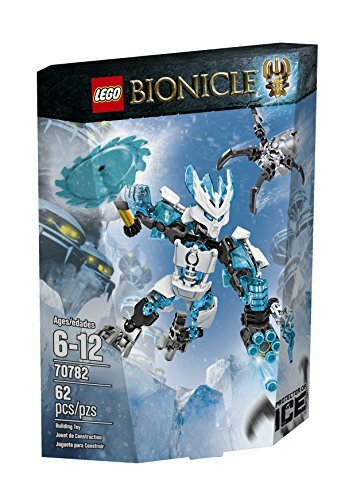 This Protector of Ice Building Kit by LEGO includes a Bionicle toy that measures in at a little over 5” in height. This is a great size for kids to handle and play comfortably with. We liked how the legs and arms can be easily adjusted. It enables kids to have complete control over how they play with their toys in different pretend scenarios. It’s also excellent for their motor skills. Children are loving how they can use the rapid shooter that’s included too. It’s a very interactive feature that helps kids to play with more imagination. 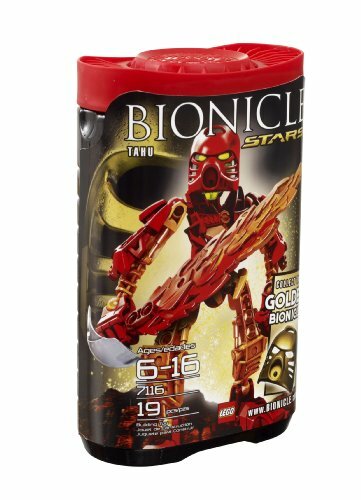 Regardless of how rough your child plays with this Bionicle toy, the durable design means that you can be assured it will last them for years. With a rapid shooter and adjustable limbs, kids are given more options to play with a ton of imagination. If you’re still feeling a little unsure about which LEGO Bionicle set to choose for your child, this is the section for you. We’ve outlined some of the main factors to consider before you pick one. This will help give you the buying confidence you need that you’ve chosen one that your child will love. There’s also a section that will take you through the various Bionicle set types to make it easier for you to differentiate between them. There are numerous beneficial factors to consider when looking at these types of toys. 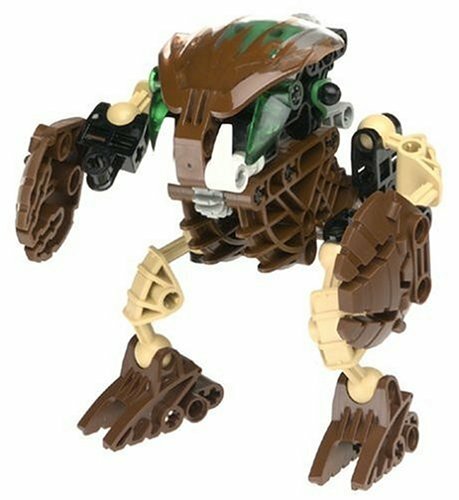 On the surface, they may not seem it, but these Bionicle creatures can have a huge impact on your child’s development. Since these LEGO Bionicle parts require assembly, your child is able to put their problem-solving and motor skills to good use. The various parts require them to put pieces together which is a fantastic building exercise. As a result, their motor skills are able to develop well. Playing with Bionicle’s is incredibly effective at encouraging kids to play with a lot of imagination. Since they can make them fight each other in inventive ways and come up with their own scenarios, children can improve their storytelling and creative play abilities. Being able to play with this much freedom is fantastic for their creative thinking and can help them be able to think outside of the box to solve problems. While most of the Bionicle toy sets mentioned in our review are fairly similar, there are a few differences that you should consider. Let’s take a look at them below. The majority of the Bionicle toys in our review come as single-toy sets. 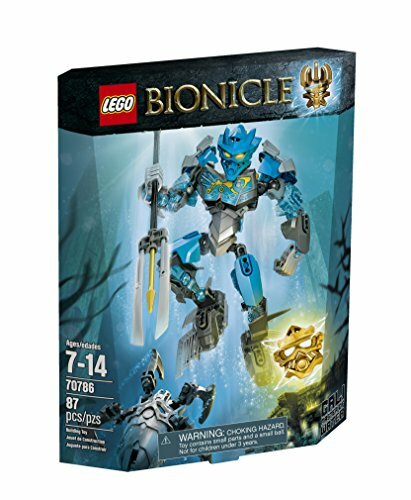 This is a popular option that enables kids to collect different Bionicles over time. These ones may be best for slightly younger kids who may struggle trying to build multiple toys at a time. 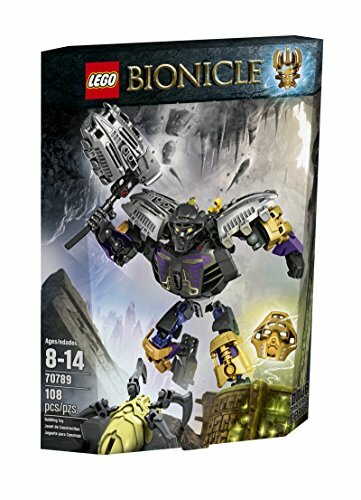 There are some Bionicle toy sets that come with a variety of figures. We recommend these ones for children who are slightly older and are able to build numerous figures. 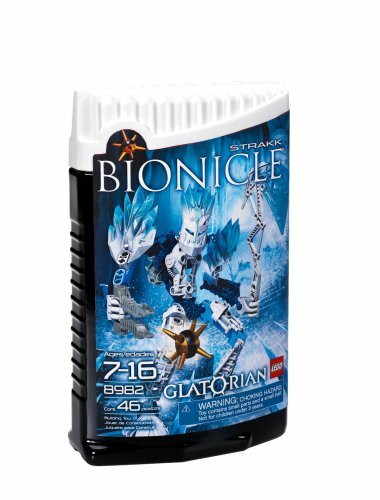 They’re great for playing with more imagination without any delay waiting for additional Bionicle toys. 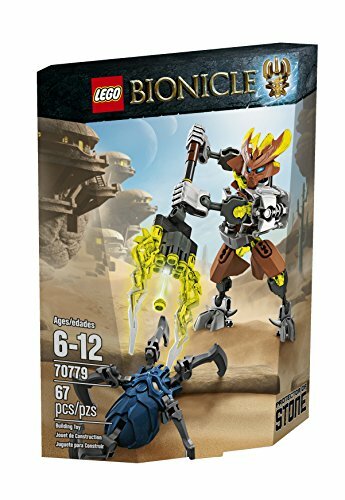 Most of the Bionicle LEGO sets include toys that have accessories. These are awesome for helping kids to play with a lot of imagination. However, they tend to come in smaller pieces. Therefore, you may need to supervise younger kids. 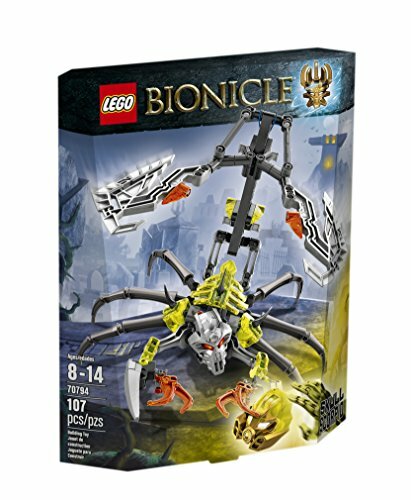 So, now that you know more about what some of the best LEGO Bionicle sets have to offer, you can simplify your search process to finding the one that’s best for your child whether their a boy or girl. 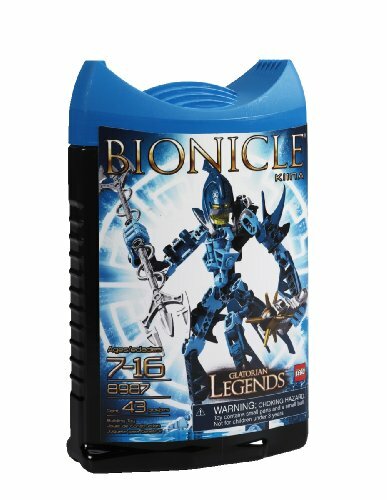 It’s important to note that Bionicle sets and Lego sets in general are thought to be preferred by boys but most girls absolutely love legos too. Be sure to consider all of the main details, pros, cons, as well as the age recommendations. We’ve provided you with everything you need to make the most informed choice possible.